Figure 8-44. - How weights should be placed when balancing tires. Figure 8-45. - Bubble balancer. assembly. The wheel assembly must be removed from the vehicle and placed on the balancer. 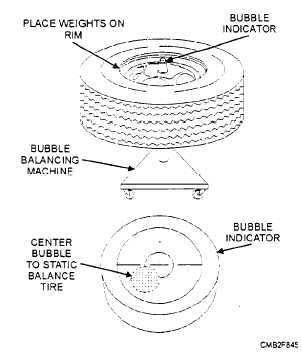 An indicating bubble on the machine is used to locate the heavy area of the assembly. Wheel weights are added to the assembly until the bubble CENTERS on the crosshairs of the machine. OFF-THE-VEHICLE BALANCER (spin balancer) can statically and dynamically balance a wheel assembly. The wheel assembly is removed from the vehicle and mounted on the balancer. The assembly is then spun at a high rate of speed. The machine detects any vibration of the assembly and indicates where the wheel weights are to be added. After the weights are added to the assembly, spin the assembly to again check for vibration. 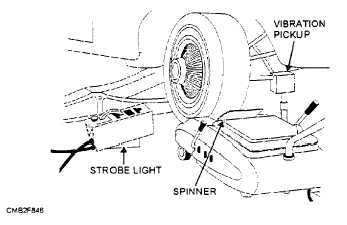 ON-THE-VEHICLE BALANCER (spin balancer) (fig. 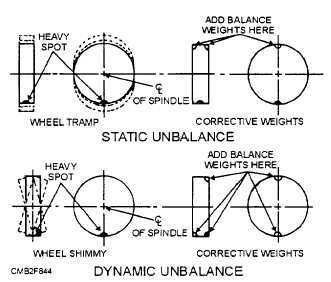 8-46) is also used to balance a tire statically and dynamically. An electric motor is used to spin the wheel assembly and either a electronic pick-up unit or hand-operated device is used to determine the location for the wheel weights. An on-the-vehicle type balancer is desirable because it can balance not only the wheel assembly, but the wheel cover, brake disc or drum, and lug nuts. Everything is rotated as a unit. Wheel bearings are normally filled with grease. If this grease dries out, the bearing will fail. Some wheel bearings can be disassembled and packed (filled) with grease, while others are sealed units that require replacement when worn. When performing tire-related service, check the wheel bearings for play and wear. For procedures on checking, removing, and replacing wheel bearings, refer to the manufacturer's service manual. Tire problems usually show up as vibrations, abnormal wear patterns, abnormal noises, steering wheel pull, and other similar symptoms. In some cases, you may need to operate the vehicle to verify the problem. Make sure that symptoms are NOT being caused by steering, suspension, or front-wheel alignment problems. Figure 8-46. - On-the-vehicle balancer.